Technology is helping players and referees in football; it’s just a shame that what we have is so limited. 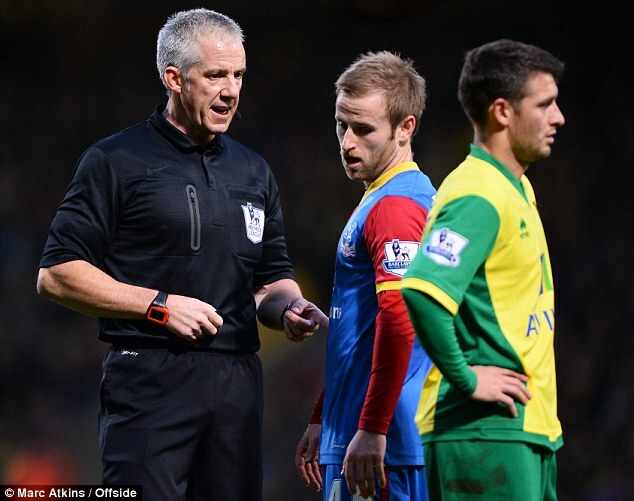 Watching Chris Foy refereeing Norwich versus Crystal Palace on Saturday it was great to see that, rather than undermine a referee’s credibility, the technology available to him actually enhanced his authority and helped his relationship with players. There were two ‘goal line’ incidents. The first followed a superb back-heeled volley by Norwich striker Johan Elmander, which thudded against the Palace cross bar and bounced away from goal. Foy calmly glanced at his wrist monitor to see if it indicated that the ball had crossed the line and the game continued. While it is unlikely that a goal would have been awarded in previous seasons, there would have been a degree of uncertainty for the match officials who — through no fault of their own — could not be certain if they had made the right decision. The same technology was used again at the other end when a thundering drive from Barry Bannan had beaten John Ruddy in the Norwich goal but was brilliantly headed up and on to the bar by Martin Olsson. The defender had to dive across the line to make the clearance and understandably Bannan appealed to Foy for a goal. The Merseyside referee smiled and showed his wrist monitor to Bannan, who accepted without any fuss that the ball had not crossed the line. With this first introduction of technology proving so successful can we hope for more to be introduced and how could it help – with facts?